Search Bev's Country Cottage for more FREE patterns! Copyright 2009, 2014 Beverly A. Qualheim - All Rights Reserved. ***CAUTION: Please remember that this knitted cozy is NOT meant for naptime or sleeping in. It's great for photo ops or keeping baby warm outdoors while you carry him/her in your arms. 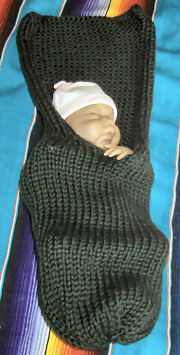 These are wonderful for newborns to age 3 months or so and can be used instead of a blanket when outdoors. Size 15 Circular needles - 24", 3 oz of each yarn Worsted weight yarn (for pink one I used Bernat Soft Boucle and Caron One Pound) - 2 strands held together OR use 3 strands of baby yarn held together. Peapod: Cast on 45 sts - leave a long tail for weaving in and gathering later. This will be the top of the 'cozy'. You are knitting in the ROUND. (Knit 1, knit 2 stitches together) repeat this around. Do another decrease row like this. Then cut 15" of the yarn and thread through remaining stitches on needle using a large eyed needle, removing stitches from needle as you go. Pull closed tightly and weave the tail in and out around, then on the inside to secure. Cast on 45 sts - leave a long tail for weaving in and gathering later. This will be the bottom of the 'cozy'. You are knitting in the ROUND. Knit for 15", knitting in the round, then gather the bottom edge. The hood serves as a protection against the elements. 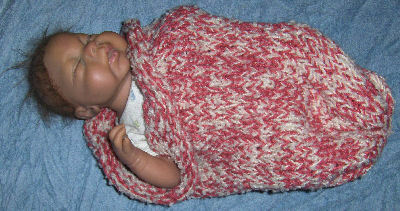 'Blanket- Hood' to cover baby's head in the wind and cold weather - now you are going to knit a flat piece, back and forth instead of in the round. Knit each knit row and purl each row for 12" to form a 'blanket-hood'. Bind off. Using a size G crochet hook, single crochet in each 'stitch' around the 'blanket-hood'. End off. Photos by SuzieQ and Disneypal- thanks! Size 8 needles and 1 oz sport yarn or baby yarn. 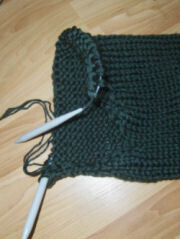 Continue in ribbing for a total of (8 rows) 10 rows. Row 9: K across row. 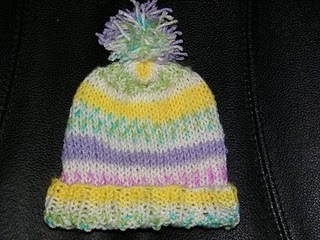 Continue till hat measures 5.5" (6"). Decrease row 1: (k2, k2 together, k2) to end of row. Decrease row 2: Purl across. Decress 3: K2, k2 together, (k4, k2 together, k4) to end of row. Decrease row 4: Purl across. Decrease row 5: K2, k2 together, (k3, k2 together, k3) to end of row. Decrease row 6: Purl across. © COPYRIGHT: All content is copyrighted to original creators. You may direct LINK to pages, but you may not post patterns anywhere in any media form. Any items made from patterns © to Beverly Qualheim may be sold, but please make one for charity too.